How Many Incidents Equal a Problem? Lori Verni is a dog trainer overseas and has an interesting blog. For most people, our relationships with our pets are strong emotional bonds, and behavior problems can be pretty upsetting to deal with. Even more difficult, is when a normally sweet, affectionate pet does something uncharacteristic, like biting someone, growling or snapping. I can safely say that if your dog is properly socialized and not the least bit aggressive, the chances of having a one-time “freak” occurrence such as this would be highly unlikely. However, as a trainer (and also a parent, neighbor, friend, etc. ), I also know that more than one “freak” incident is not a coincidence. It’s a behavior problem. I’m often amazed at how frequently people will look the other way and not do something about their dog having a problem. I understand it’s upsetting. I realize dog training costs money and takes time to practice. But in the scheme of things, it seems far more costly, both emotionally and financially, to endure incidents such as bitten people, police at the door, angry neighbors and more. Working with your pet on a behavior problem now can prevent much aggravation from occurring in the future. In addition, stopping the problem before there are any more incidences could be a matter of life or death for your dog. Does this sound overly dramatic? It’s not. The cold, hard truth is that with enough reported problems, your dog could cause you to pay fines, could be taken from you by authorities and a lawsuit could even result in euthanasia. Perhaps you’ve worked with a trainer before but your dog seems to be still having a problem. Did you follow the methods recommended? Did you practice and make the training a way of life? Were they educated and experienced? Has a knowledgeable pet person, such as your vet, groomer, trainer or rescue person warned you that a problem was developing but you didn’t take them seriously? If any of these things are the case, keep in mind that it’s never too late to work with your dog. Don’t wait for problems to get worse. As difficult as it is to admit there’s a problem, it is far better to take steps and do something about it now. Whether you work with your dog on your own or with a knowledgeable trainer, taking issues seriously and working on them immediately will surely help prevent more problems from occurring in the future. 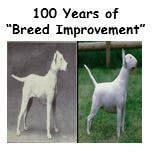 It is actually frightening to look at what dogs looked like in 1915 and what they look like now - man should leave nature alone! So often people that the dog gave no warning before the bite - unless Idiopathic Aggression (which is very rare) all that is happening is that we are not recognizing the warning signs.